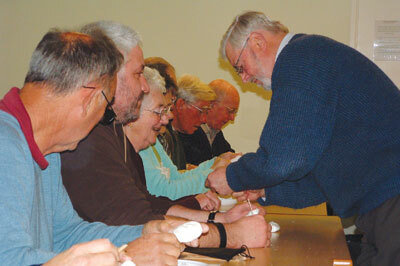 The Ringwood Woodcarvers formed in 2005 and meet on the first and third Tuesday of every month at St. Ives Village Hall, near Ringwood in Hampshire. The Ringwood Carvers have a sister club, the Hants and Dorset Stickmakers, and although the two clubs meet elsewhere, they work closely wherever their interests coincide. These interests include anything from insurance to publicity and events, especially the popular 'Dorset Do' which features plenty of demonstrations, guest speakers and a buffet lunch. Fees payable for each night of attendance at both clubs currently stand at £2.50. The club includes three carvers who, in successive years, won a silver prize (Keith Davies), a commendation (Moira Powell) and a gold prize (Bill Merrington) in Woodcarving magazine's International Woodcarver of the Year competition. Additionally, there are many other members with considerable skill and experience, willing to give guidance to beginners and new members. We have a selection of tools available for beginners but actively encourage members to purchase their own. 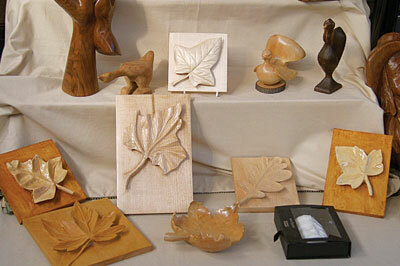 Wood is available for the first project, which we advise to be a small relief carving of a leaf. During that first project we encourage beginners to plan their second project and guidance is given on topics such as selection of projects, wood, and tools. This includes full suppliers' details as well as tool types and indicative prices. A range of suitable projects for beginners has been selected from back issues of the magazine, which excellently illustrate projects at each stage. By the second project, beginners are able to source materials and progress with projects needing less assistance. A mentoring system has been introduced for those in need. Our website enables us to advise beginners on the matters mentioned above. As well as including a gallery of our members' work, it enables us to inform everyone of our upcoming events. 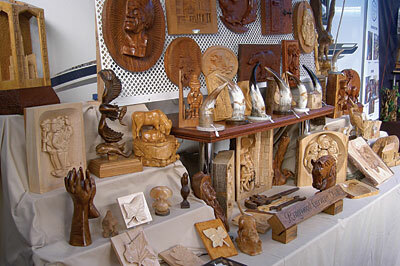 An important part of the events programme has been visits to places of interest such as suppliers' exhibitions (Yandles); showing newcomers other carvings, techniques, wood and tools. We have outside speakers at our regular meetings from time to time. The social side is not neglected either, with dinner and entertainment evenings throughout the year. The club has a number of working relationships with other local groups, whether they are woodcarvers or related woodworking groups such as turners, stickmakers and coppice groups. 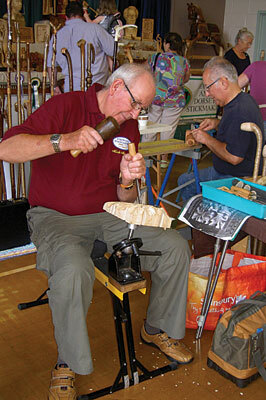 At several of the shows we attend, the display area is shared with local woodturners or stickmakers. Typically, the club attends at least three shows a year, enabling members to show their work. Many new members come to the club through these events. The work of beginners helps to illustrate to the public the structured approach we have developed for our newcomers. Over the years we have developed our display skills in order to show our members' work more effectively. This has resulted in attractive overall displays and awards for their quality. Much of this has come from displaying carvings at appropriate heights and positions. Other techniques including lighting and turntables are used and are being experimented with. Our members have a very wide variety of carving interests ranging from hedge trimmers and cars to medieval and renaissance art. In between these two extremes, interests include animals, birds, fairy tale figures, country scenes, portraiture, abstracts, armorial, signage, the human form, humour, stick carving, pyrography and bowl carving - just to mention a few. Are you a member of a carving club? 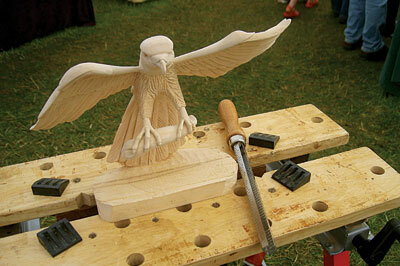 Contact Woodcarving and let us feature you in Club Profile.